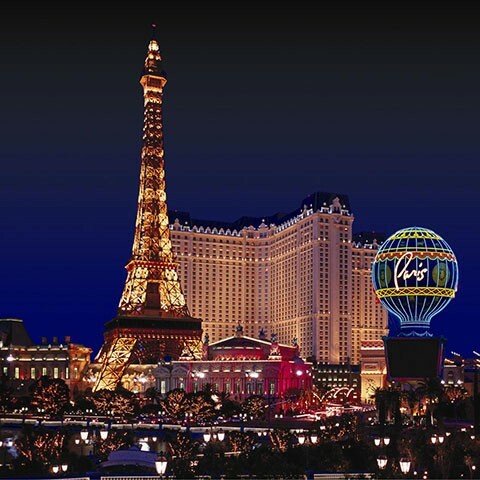 Paris Las Vegas brings the romance and excitement of the European City of Light to the heart of the Las Vegas Strip. The passion and sophistication of Paris Las Vegas transports guests to Europe’s most romantic city. From its dramatic 50-story replica of the Eiffel Tower to authentic architectural reproductions, Paris Las Vegas is a romantic, relaxing destination for anyone looking to get away. The resort features elegant décor, European-inspired boutiques and a distinctive array of fine cuisine, including Chef Joho’s acclaimed Eiffel Tower Restaurant, Gordon Ramsay Steakhouse, American Brasserie and French-bistro Mon Ami Gabi. Paris Las Vegas is one of the best in Vegas gaming. At Paris Las Vegas, play enticing table games like Vegas blackjack, craps, baccarat and roulette. For the serious player, the Salon des Tables offer high limit excitement. The Las Vegas casino’s race and sports book offers multiple TV screens, current game scores, comfortable seating and its own bar area. The resort also features more than 1,700 slots within the casino’s Parisian-inspired streetscapes. Take a chance on these themed casino slot machines and the multi-million statewide Megabucks games. Take it up a notch on the high-limit Champagne Slots, located within an exclusive Parisian designed courtyard. Rise above the frenzy of the Strip at one of Las Vegas’ premier attractions with amazing views. The Eiffel Tower tickets are available for purchase at the Eiffel Tower Gift Shop. An icon of the city skyline, the high-altitude attraction is located 46 stories up and is a half scale replica of the world-famous Paris, France landmark. The observation deck features 360 degree city views and knowledgeable Ambassadors point out Las Vegas landmarks. A popular spot for weddings, the Eiffel Tower Experience is especially romantic at night. The views of the bright, colorful lights and the lit water show are unmatched. Double the romance with dinner a few stories down at the 11th floor Eiffel Tower Restaurant.